← Five Things aka I’m Not Dead! It’s not so much the eating hot dogs in the wilderness or the smell of campfire, or even the prospect of getting swept up in a giant rain storm while sleeping in a tent. I can handle all that, and mostly even enjoy it. But I truly detest not having an actual toilet for longer than a race morning (and a sink to wash my hands), and sleeping in a little cramped space on mere mat padding for an entire weekend. Call me high maintenance if you will (mostly every one does), but I want a bathroom and bed. If camping included those things and combined the greatness of the outdoors with human comforts, I’d be willing to go every summer weekend. I really try to be a good sport about it though. It may not be the way I want to spend my time, but I try not complain…at least while we’re there. Just, you know, on the blog after the fact. Aaron on the other hand, is a mountain man. He even considers “car camping” to be a lesser form of the activity. He’d rather back-pack into somewhere and live off of the land with whatever supplies he can fit into his sack. Look at all that camp gear! During our first few months of dating 5 years ago, I consented to go camping (gotta impress), but other than that, I’ve kind of managed to avoid this whole hobby of his. But that means that he hasn’t gone either. And while I may hate camping, I also don’t want to deprive poor Aaron of something he truly loves (but kind of, because BATHROOMS). Long story short: we went camping last weekend. We’re getting to the peak (hehe) of our Imogene training, and we’ve been trying to get some higher elevation mountainous trail runs in, and all of those trails are closer to camp grounds than actual cities, so there you have it. Leave it to running to break my non-camping streak. Our trail run was 15 miles, and afterwards I wanted nothing more than to prop my feet up, and sleep in a very comfortable bed. But, it is what it is. We went up to the North Central part of the state to a place called Lake Heron which is almost more of more of a resort campground where you have people on either side of you, lots of happy Forest Ranger friends, a latrine style toilet (which was ok on Saturday morning but downright disgusting by Sunday morning with all of the use and ten million flies swarming). The next cluster of sites next to ours even had a camp host and showers (which were actually pretty decent). They even had daily activities like ukulele lessons and snake education. Aside from the fact that we could hear everything our camp neighbors were saying (and every scream of the sick toddler they brought with them), having a shower, and something resembling a toilet was nice. But I was mostly obsessed with the lakefront property. I spent the weekend taking pictures of our amazing view. And enjoying the water since it is mostly non-existent in Albuquerque. The water levels statewide are ridiculously low right now, so the lakes (I think all of them here are man made) are having to let out a bit to provide water for the rivers. It looks like they just did a major water lowering a couple of weeks ago, so the shore right by the lake was not only very muddy in a “hasn’t been dry in decades” type of way, but also filled with treasures. And by treasures I mean really old beer and soda cans. I was also amazed at how many fossils I found right next to our campsite. Nothing too amazing like dinosaur skeletons or fish bones, but plenty of sea shells! Considering the number of people who hang out there, it looks like I’m the only person who has ever rock hunted. Aside from our 15 mile trail run (more about that on Monday), other activities included drinking wine, playing with the camera, bike riding, kayaking (oops…forgot to take pictures), middle of the lake picnicking, and exploring. We even saw a herd of deer! (hopefully they were not caught by the gang of howling coyotes that woke us up later that night…). The drive to and from Lake Heron was also quite beautiful. We were surrounded by dramatic cliffs and Northern New Mexico landscape. We also stopped by a small town called Abiquiu to take a picture of this neat mission church built in 1920. Overall, if this is something I can get away with doing once every five years (heck, I’ll even make it four! ), than I think I will survive. As always, it was nice to get out of town and do a long run on a new (yet ridiculous) trail. The weather here is already starting to cool down (sadness), and our warm summer weekends are numbered, so just getting to spend time outside might have even been worth some of the yucky parts of bonding with nature. Maybe. 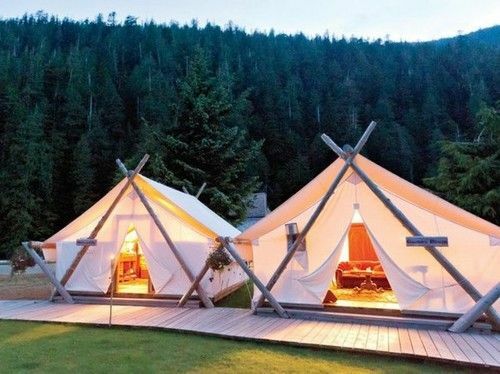 Love camping or want to join me in the whimsical canvas tent and king bed resort place? HAVE A WONDERFUL WEEKEND! It’s turned into an unofficial holiday around these parts because of the Breaking Bad premier on Sunday. I use to be against camping but Coachella the past two years has hit me with the realization that if I am going to camp I want to do it in an area with nothing but mother nature. So I guess I would prefer to be more of a hiker than a camper, i.e. “A’s” version of putting everything in a pack and going…I have all the gear but marathon training is getting in the way of it right now. As for camp food…beef jerky! A for effort but it sounds like “A” needs to just head out with others to get his camping/hiking fix. And, those cans are awesome but annoying at the same time…frickin people. The group we would go camping with is all couples, so it would be weird for him to leave me behind! I think he is planning a solo trip here soon though, which I fully support! And totally agree on beef jerky. That’s usually my road trip snack! um, I love/hate camping. Hate it for the same reasons you do but the good outweighs the bad for me 🙂 We usually go one a year. I love eating Gushers while camping. Gushers! I didn’t know they still made those! I’m more of a car camper, and the Gypsy Runner is like Aaron — he prefers backpacking. So we did one of each kind of trip this summer, which was nice. I don’t mind the lack of toilet as long as I have some privacy (so many stories about camping on the Outer Banks of NC where there are NO TREES and NO TOILETS. Ugh). I can relate to the need for running water though — whether that’s out of a faucet or from a stream. It makes a world of difference to be able to rinse your hands and wipe your face with a wet cloth. Depending on the weather, 2-3 days in the wilderness is my max. After that, I really do crave a real toilet, shower, and a bed. Good for you for “roughing it”! I’m sure Aaron really appreciated it. Maybe next time you can go for a 1 night backpacking trip? Yeah, I think I would have rather just used the natural facilities instead of the latrine (it was seriously so awful by Sunday), but there was no way with so many people. I think Aaron is going to head on a solo backpacking trip here in the next few weeks, which he probably prefers because otherwise he’d have to hear me whine the whole time! Hi! You might have liked this camp ground then! Aside from the gross toilet, it really wasn’t too bad…the camp ground cluster next to ours actually had flushing toilets and showers, so if we’d stayed in that area, I think I would have been much more satisfied! I literally just stared at that molehill, iPad up to my nose, until I saw the ants! Very cool. I’m with you. Give me a cabin with running water and a big down feather bed – I’m totally in! Hi! I didn’t even see the ants until Aaron pointed them out. Glad you found them! Pretty pictures! In answer to your first question…can I say both!? I actually LOVE camping, although, I like campsites that have showers close by; I can only do about two days camping without a shower or I get cranky. (i’ve done longer no-shower camping trips) but I do really like tents, sleeping bags on the floor, etc. But that picture of the resort place looks super fun! Favorite camp food: smores. MMMM….. I LOVE s’mores! But we couldn’t find gluten free graham crackers for Aaron this time, so we just had gf cookies instead. NOT THE SAME! Apparently they do, but I haven’t found them. Maybe marshmallows on GF cookies???? It does sound like a great experiment! I love camping. My wife? Not so much. So about 6 years ago, my father-in-law got a big 8-person camper so our whole extended family could go camping periodically but still have AC when it’s blazing hot, a working bathroom, and an essential shower. It was the only thing that was going to get my wife out of the hotels and into the great outdoors. And it worked. Hi Jack! Sounds like your wife needs to come with me to the camping resort! I ❤ camping and I ❤ my tent! I put up with the lack of bathrooms because the views you can get in the backcountry can be amazing! Hi Stephanie! I agree the views are amazing! I think I’m at least warming up to the idea…a little bit!